Following a two-part public hearing, the Canadian Nuclear Safety Commission (CNSC) announced today its decision to renew, as a single licence, the power reactor operating licences for the Bruce A and B Nuclear Generating Stations (NGS) located in the Municipality of Kincardine, Ontario. The licence will be valid from June 1, 2015 until May 31, 2020. The renewed licence authorizes Bruce Power to proceed with the operation of the Bruce A and B NGS Units 1-8 beyond 210,000 equivalent full power hours (EFPH), up to 247,000 EFPH. In making its decision, the Commission considered information presented at a public hearing on February 5, 2015 in Ottawa, Ontario and from April 13 to 16, 2015 in the Municipality of Kincardine, Ontario. During the public hearing, the Commission received and considered submissions from Bruce Power and 144 intervenors, as well as CNSC staff’s recommendations. The Summary Record of Proceedings and Decision of the hearing is available on the CNSC website in both official languages at nuclearsafety.gc.ca. A detailed Record of Proceedings, Including Reasons for Decision will be published on the CNSC website at a later date. The webcast of the hearing is archived on the same site for 90 days. 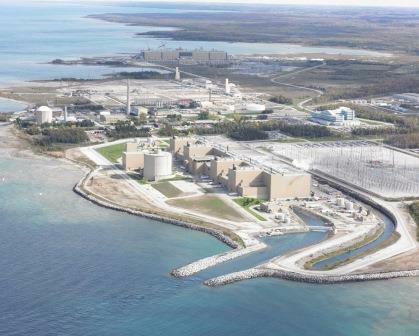 Bruce Power is licensed by the CNSC to operate the Bruce A and Bruce B Nuclear Generating Stations, located in the municipality of Kincardine, on the eastern shore of Lake Huron, Ontario. The CNSC has full-time staff at the stations, performing inspections to evaluate operations and to verify compliance with regulatory requirements and licence conditions.